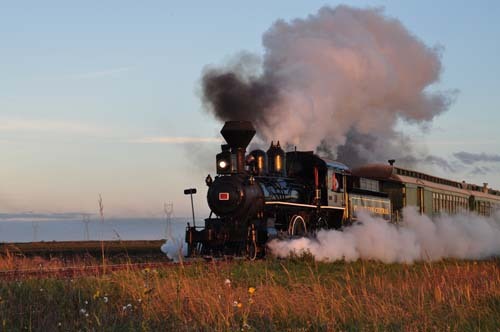 Little has been formally recorded about the key events prior to 1970 that led up to the formation of The Vintage Locomotive Society Inc. and the commencement of the Prairie Dog Central operations. Locomotive No. 3 worked out of Pointe du Bois for Winnipeg Hydro from 1918 to 1961 when she was retired and stored at the Pointe. Shortly after that, Councilor Leonard Claydon came up with the idea of having No. 3 brought to Winnipeg to operate during the 1967 Pan Am Games. He was successful in obtaining money through City Council to have No. 3 brought by flatbed truck to Winnipeg in October 1966. It was taken to the GWWD yards in St. Boniface. Through a routine inspection it was determined that No. 3 would require new tubes if she were to operate. Funds for re-tubing were not available, and therefore No. 3 never operated during the PAN AM Games as had been hoped. It was during this time (i.e. 1966-67) that 3 of the founding members entered the picture. The late John LePage and Ralph Grant had known each other through the Red River Valley Live Steamers Association, and had become aware of Leonard Claydon’s ideas for No. 3. Gordon Younger was also aware of these plans, although he was not previously acquainted with Le Page or Grant. Through their common interest in No. 3, they became connected with one another, along with a few others, as well as with Leonard Claydon. There was an initial meeting of this group in the basement of Leonard Claydon’s hardware store on Sherbrook Street. At that meeting, the group was offered custodianship of No. 3 and combination coach #103. It was sometime after this meeting that formal steps were taken to develop an organization which would be responsible for the custodianship of the locomotive and combination coach. On April 4, 1968, the Letters Patent Of Incorporation of The Vintage Locomotive Society Inc. were formally registered under The Companies Act through the Deputy Provincial Secretary for the Province of Manitoba. There were 9 original members named on the Letters Patent Of Incorporation: John Le Page, Ed Kolson, Wilf Henrickson, Ralph Grant, Gordon Younger, Wilmer Ferguson, Jack Collier and Harvey Hersom. Once the Society became established, it formalized efforts aimed at getting No. 3 operating again. Even though the PAN AM Games had come and gone, the target then became Manitoba’s Centennial in 1970. To that end, the group began its activities, primarily to raise money and secure the necessary support to get No. 3 running again. On a few occasions, No. 3 was quietly steamed up in the GWWD yards and run a short distance. By this time, the group had become acquainted with the late Lloyd Gooding, CN’s then Prairie Region Operations Manager. It had become clear to the group that the only probable place they could operate was on CN. In late 1968, the locomotive and combination coach were moved to the CN Transcona Shops. It is interesting to note that the Society’s original desire was to operate No. 3 on the Oak Point Subdivision to Grosse Isle, although this did not happen until 1975. In 1969, the possibility of operating No. 3 for Manitoba’s Centennial was starting to look promising, although very little was confirmed. Discussions with the Manitoba Centennial Corporation seeking financial help to re-tube No. 3 took place sometime in this period. During the Winter of 1969-70, that help was confirmed by the Corporation in the form of a $17,000 grant, and No. 3 was moved into CN Transcona Shops for re-tubing sometime after April 1969. Centennial celebrations for 1970 were to include a July 1st trip to Lower Fort Garry using the Prairie Dog carrying the then Prime Minister of Canada, the late Pierre Elliott Trudeau, his Cabinet and members of the Manitoba Legislature. In June 1970, No. 3 emerged from Transcona Shops. It was felt that a short trial trip with No. 3 along with coach nos. 103, 104 and 105 was necessary to ensure there would be no technical snags on the July 1st trip. This trial trip to Lower Fort Garry took place at the end of June. It was done without any fuss or fanfare, although a small crowd of people who had known about the event had gathered at the station. On Wednesday, July 1st, 1970, the trip to Lower Fort Garry occurred as planned, and the event was well covered by the media.